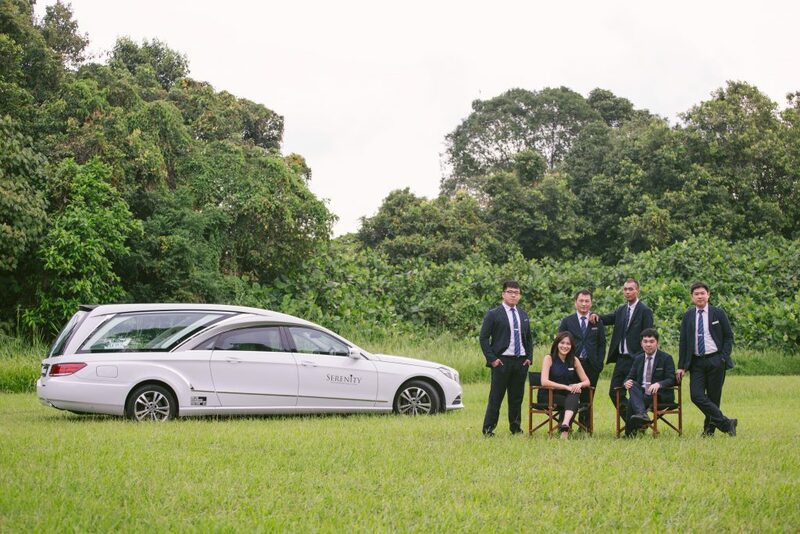 Back in 2009, when Elson Chong was just 24, he decided to take the path less traveled and set up his own funeral company – this made him one of the rare young men in the industry. It wasn’t a random decision though. His parents ran a funeral home as well, and eversince he was in secondary school, he often helped out in the family business. It was only after completing his National Service (NS) did Elson decide to start up his own funeral home. Although his parents were very supportive of his decision, they did not help him to kickstart the launch by providing any financial or manpower assistance. With his $650 NS pay, along with a few hundred dollars in his bank account, he started up a family-run Christian funeral home called Serenity Casket and Funerals. The now 32-year-old had roped in his wife Sarah Ang and sister Nicole Chong, to come onboard to help grow the company. Both of them are embalmers with the company; and as the founder and funeral director, Elson oversees the day-to-day operations. At the tender age of 19, Nicole joined her brother’s company to be an embalmer despite no formal training in the field. She holds a diploma in general studies from private institute Kaplan, and picked up the skills through on-the-job training under the guidance of Sarah. I have always been interested and puzzled at how a body, which has passed on for many days, is able to stay intact. It was only when my sister-in-law went to New Zealand for her embalming course that I got inspired [to follow in her footsteps]. Being an embalmer is clearly not a conventional job, but Nicole thinks that it’s beautiful that she gets to help “give the deceased a good send-off by providing the best embalming care”. Unfortunately, there are some people in her circle of friends who shun her career choice. They believe that those working with the dead carry a “bad omen” – some of them would stop talking to her, and some would avoid her altogether. Explaining more about her job, Nicole said that embalming is the science of preserving human remains by treating them with chemicals to forestall decomposition. Essentially, its purpose is to keep the bodies suitable for viewing at a funeral. “I want to make them look visually pleasing so their families can have a good last memory of them during their final send-off,” said Nicole. As an embalmer, her main role is to embalm, dress, casket, cosmetize, and do restorative work where necessary. On a day-to-day basis, the 22-year-old will put on a protective gear from head to toe before evaluating a case. After evaluation, she will decide on how to prepare the bodies for funerals. During embalming, Nicole will first massage the deceased with soapy sponge to help facilitate drainage and distribution of embalming fluid. And thanks to the dye content in the chemical fluid, the body’s tissue will start to give a rosy appearance. Nicole then washes the body and preps it – she combs their hair, and applies cream on their face to prevent skin dehydration. Thereafter, she helps to dress and apply cosmetics on the deceased before placing it into a casket for viewing. Although Nicole is not an officially certified embalmer yet, she insists that she can manage and embalm bodies by herself without much supervision from Sarah. In fact, she has handled about 600 bodies to date. But being an embalmer is not easy. Although the official working hours is 9 to 6, she actually works beyond these hours. “There have been many times when we have to send the deceased back in the middle of the night. Embalming at 1 or 2 am is very common for me as we have to send the deceased back early in the morning the following day,” said Nicole. 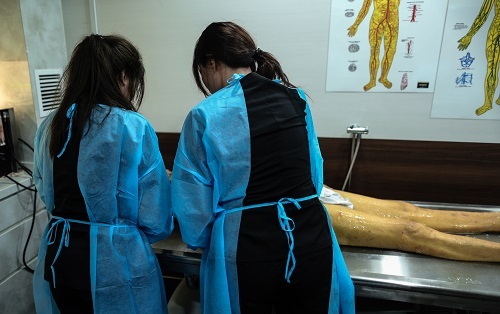 When asked about some of the challenges she face in her job, Nicole said despite being in the profession for three years now, she still finds it very hard to embalm a decomposed body. In fact, there was a time when she had to embalm a slightly decomposed body, which had maggots crawling out of the body’s flesh. She also recounted a tough time when she had to handle the body of a dead acquaintance. The closest person she has ever embalmed is the company’s hearse driver, who died of a heart attack two years ago. She figured that helping out in the embalming process would at least ensure that his body is treated properly. When I asked Elson about the business struggles he faced during the company’s early days, he said that besides financial difficulties, he also had trouble getting the clients to believe in him. [Ours] was a small humble funeral home, unlike other big established companies in the industry. As finances are tight, I had to come up with all sorts of ideas to make sure the company runs well with that small budget. Thankfully, his hard work and determination reaped rewards after four years. 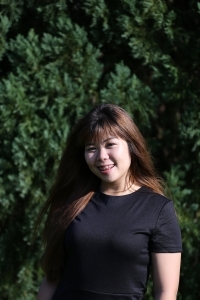 “In my first year of work, I had only one part-time worker and handled only 16 cases a year. Now, we handle 18 to 25 cases a month, together with a team of 10 full-timers,” said Elson. It’s evident that their business has grown tremendously over the years. And as part of their headcount expansion, the company has started its own logistics team to help set up the funeral wake. While it’s true that the funeral industry will never die, it has been greying instead. The people who work in this industry are typically older, having inherited the family trade, or are perceived as having no other choice than to work in what many consider to be a grim environment. But times have changed, and we now see the undertaker industry getting new blood with the emergence of young entrepreneurs such as Elson himself, and even Jenny Tay, who helped to revamp her dad’s funeral business. Nonetheless, Elson does not think that the deathcare industry is bulletproof. In this modern world, there is no longer any bulletproof industry. It is getting more competitive and we need to always be on the edge to look out for new products, and new ideas to inject to our company every couple of months. “In the upcoming years, I think the industry will get even more competitive as rival companies will start to copy everyone’s idea. It’s very important that we have our own ideas to differentiate ourselves from others,” he added. At the end of the day, Elson never regretted his career choice. Being in this industry helped him understand and cherish the true meaning of life, and everyday, it reminds him of how fragile life is. In turn, he is continually grateful and appreciative of everything that he has right now. Young adults nowadays are financially dependent on their families, but I believe it’s better to use your own savings. That way, you will better understand the hardship of needing to provide for yourself.